Desperate to solve my murder, my long-lost twin, Emma, is pretending to be me and unraveling the many mysteries I left behind - my cryptic journal, my tangled love life, the dangerous Lying Game pranks I played. She’s uncovered my friends’ darkest secrets, but she’s never had the chance to dig into Thayer’s past - until now. Thayer’s back and Emma has to move fast to figure out if he’s after revenge... or if he’s already gotten it. 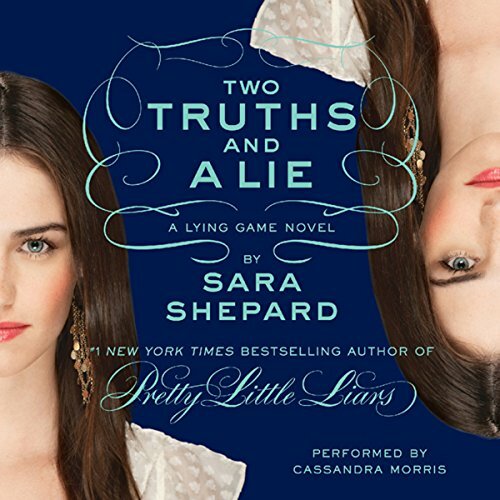 What did you love best about Two Truths and a Lie? The way it leaves you guessing about who killed Sutton. Emma because she knows how to play the lying game. Have you listened to any of Cassandra Morris’s other performances before? How does this one compare? Yes, she is always outstanding. The third book in the series didn't disappoint. I found that it wasn't as suspenseful as the first two in the series. At this point I just wish there was an ending in sight. I know the 5th book is due out later this year. I probably won't read anymore until I find out if this is the last one. I just want it to end, Unlike Pretty Little Liars, which I read the first eight excitedly, then she ended up coming out with a whole bunch more. Still enjoying the story as it unfolds but frustrated that it's predictable. Everything follows the same trend and the "surprises" are not surprising.